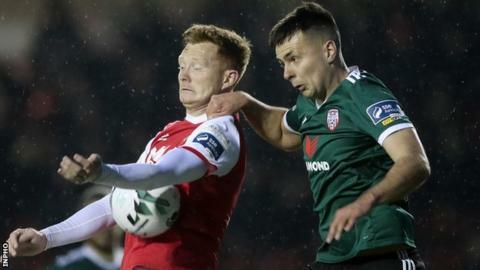 Derry City moved into second place in the Premier Division with a 3-1 away win over 10-man St Patrick's Athletic. The Candystripes go above Bohemians on goal difference after Bohs went down to a late 1-0 defeat at Dundalk. Bruna scored his second goal for Declan Devine's side with a beautifully struck 18th-minute free-kick into the bottom corner and a minute later Toner was dismissed for a rash challenge on visiting captain Ciaron Harkin. On the half hour Junior steered the ball into the net with his body at the back post to extend Derry's lead. Centre-back Shaw threw St Pat's a lifeline when he found the net with a diving header soon after but the remainder of the game failed to yield many clear-cut chances. Derry's busy period of fixtures continues on Friday when they host leaders Shamrock Rovers at the Brandywell, followed by an away match with Waterford on Easter Monday.